easy-guard Class 0 Fire Upgrade System is a three coat multi-layer system (primer, high build + paint) that successfully upgrades the Exova Warrington Fire “Blue Board” to Class 0 when tested to BS476. Where unknown multiple layers of paint have been allowed to build up potential fire hazards exist. Fire can move around a building using these volumes of paint as a fuel source. easy-guard Class 0 Fire Upgrade System has been designed to eliminate flame spread and complies to the very highest Class 0 (B-S1, d0) standard as set out in the latest Regulatory Reform (Fire Safety) Order. Upon the completion of a satisfactory adhesion test, the easy-guard Class 0 Fire Upgrading Primer can be applied. easy-guard Class 0 Fire Upgrading Primer ensures excellent adhesion of the high build intumescent layer of the easy-guard Class 0 system and increases paint durability. easy-guard Class 0 is water based and brush, roller or spray applied. easy-guard Class 0 Barrier Compound is the Flame Retardant backbone of the easy-guard Class 0 Fire Upgrading system. Supplied as a 25kg sack of powder, easy-guard Class 0 Barrier Compound is mixed with water to create a high build, intumescent, polymer modified, creamy paste not dissimilar to plaster. The easy-guard Class 0 Fire Upgrading Barrier Compound should be applied in line with the application instructions supplied and looks best on walls when given a textured finish (Circle, Swirl, Stipple, etc). 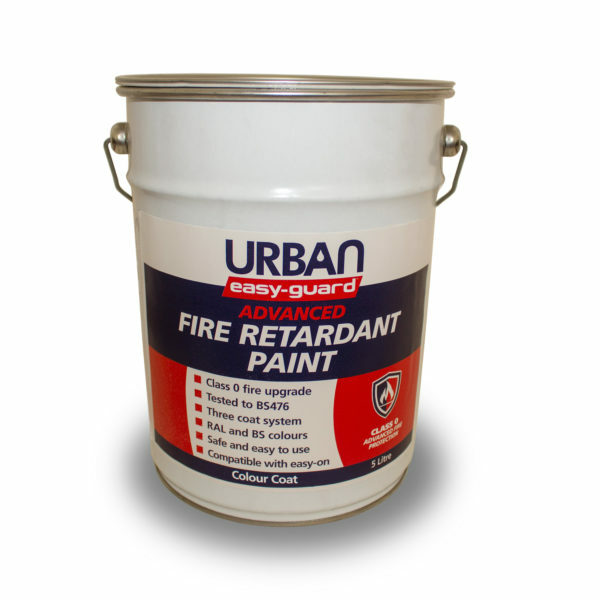 Available in any RAL or BS Colour (Special Colours available on request) easy-guard Fire Class 0 Upgrading Colour Coat is the decorative, high-quality Paint component of the easy-guard Class 0 Fire Upgrading System. Applied by brush, roller or spray easy-guard Class 0 Colour Coat is a water-based, single pack paint product perfect for high traffic walls in communal areas. For added durability easy-guard Class 0 Colour Coat may be over-coated with easy-on Durable Anti-Graffiti Coating (below). The easy-guard Class 0 Fire Upgrading System may be completely encapsulated with easy-on Durable Anti-Graffiti Coating. Tested as a complete system by Exova Warrington Fire, the easy-guard + easy-on (Fire Upgrade + Anti-Graffiti) system offers 20+ years of Fire Upgraded, durable anti-graffiti protection for your walls and ceilings. Perfect for those looking for best value, long life solutions for Social or Communal Housing Projects.